Beginnings kicks off the album with an inspirational and powerful anthem that celebrates life and our resiliency. When things don’t go the way we’d like, we can heal and re-boot our lives. 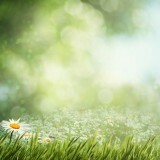 “Beginnings” is a feel-good song to unite all of us towards a happy and peaceful world. The album is performed and written by award-winning pianist and composer Barbara Graff. 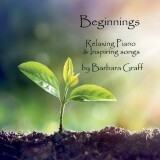 The vocal version of “Beginnings” features Barbara’s piano and Diana Chittester on vocals. Diana is a spectacular guitarist and vocalist who has performed vocals and guitar live on NPR’s Tiny Desk concerts. “Inspiration,” the second track on the album, is an instrumental piece with a magical quality that has received rave reviews. It was “inspired” by a song in the public domain, yet during creation became its own piece entirely. “Blue Sky” is sunny and bright like its name and is one of the most relaxing pieces you could possibly hear. “Bring me a Rainbow” is an instrumental version of Barbara’s piece with vocals that is a fan favorite on Pandora Radio. It is haunting and beautiful yet somehow still uplifting. “By My Side” and “On My Own” are full instrumental pieces featuring live recordings of violin, drums, steel guitar and more. “Magic Within” and “Dancing Shadows” are contemplative piano solos. The album finishes with a pop version of “Beginnings” where you’ll encounter a cool surprise in the part of the song musicians call the “bridge.” While retaining the spiritualty and enchantment of the piano version, it has the feel of contemporary dance music. Every song on the album is written and arranged by Barbara Graff. Matt Troja is Barbara’s incredibly talented producer for the “Beginnings” versions; Matt has produced several name artists including Keith Urban and Lady Antebellum! Several other pieces include the stellar skills of audio engineer Chris Lieber. After Barbara wrote the lyrics for “Beginnings” it became a metaphor for the crossroads in her life. We hope this album, with the many uplifting songs and instrumental pieces, can inspire you during any critical crossroads in your life.